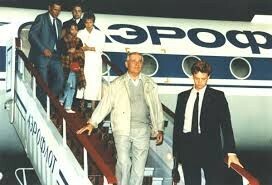 There is a cluster of days, starting with today, in 1991 and before which were fateful for the Soviet Union. August 23, 1939: Foreign Ministers Vyacheslav Molotov (Soviet Union) and Joachim von Ribbentrop (Germany) signed an agreement not to go to war against each other. It included a secret protocol in which the two countries divided up the territories between them: Finland, Poland, the Baltic States, Romania, Hungary, and Czechoslovakia. Germany invaded Poland in September, and the Soviet Union invaded Finland in November. That was the start of World War II. The Soviet Union took the Baltic states in June 1940, but a year later, Germany invaded them. In 1944, the Soviets returned to drive the Germans out. 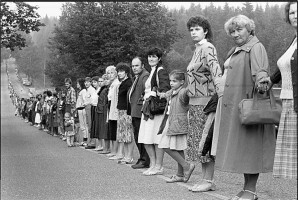 August 23, 1989: People in the Baltic states, now republics of the Soviet Union, formed a chain, holding hands from Tallinn to Vilnius to protest the Molotov-Ribbentrop pact. 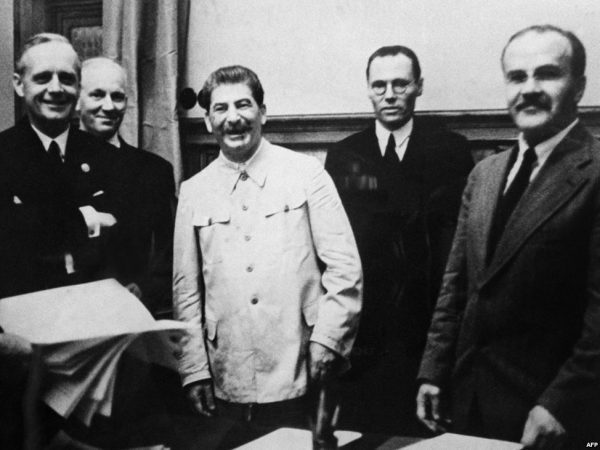 At that time, the Soviet Union refused to recognize that the secret protocol to the pact existed. Although the Baltic states were under Soviet rule, most other nations did not recognize this and dealt with Baltic governments in exile. This is the situation now with the Russian occupation of Crimea. Mikhail Gorbachev was First Secretary of the Soviet Communist Party, and there was unrest across the Soviet Union and its satellites. In October, Gorbachev gave the satellite countries (Poland, Czechoslovakia, Hungary, Romania, Bulgaria, and East Germany) autonomy from Soviet Communist rule. August 19, 1991: Soviet military personnel stage a coup against Gorbachev. Lithuania had declared independence in March 1990, and several other Soviet republics were moving toward independence. Gorbachev was considering liberalizing the Soviet constitution to allow more freedom to the republics. The coup plotters felt that Gorbachev was betraying the Soviet Union. Gorbachev was weakened, and Boris Yeltsin, the president of the Russian Republic, strengthened himself politically by standing against the plotters. The coup failed, but it assured the end of the Soviet Union. Over the next several days, Latvia, Estonia, and most of the other republics declared independence. (New York Times, BBC, Association for Diplomatic Studies) Through the next months, other republics declared independence, and finally, on December 25, the Soviet Union was formally dissolved. This is the damage that Donald Trump is doing to the United States.